With the File Browser users can browse through all categories. 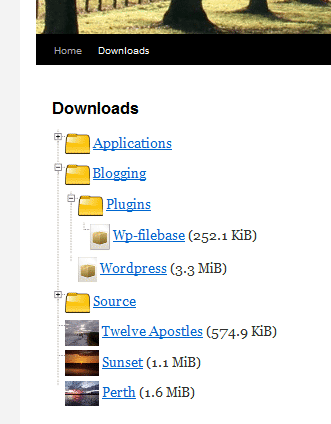 It will appear on the Page or Post set in WP-Filebase Settings. If search integration is enabled the File Browser Page will be included in search results listing all matching files using the Default Template. Sorted it. Forget using the shortcode parameter to sort categories – change the settings in WP-Filebase (on the File Browser tab). Only wasted 2 hours on that! D’oh. I’m wondering if there is a way to switch off the “Add Category / Add File” links in the File Browser, either for everyone and/or for certain roles. I’m also wondering about that. Does anyone have a solution? This was added to latest update. I’m trying to display all folders on initial file browser page. Not fully expanded to show files, but show all folders/subfolders. Tried shortcodes, settings, etc… No dice. PS. this is by far the most useful file and downloads manager i’ve used. Thx a lot for this plugin! If you need to change FileBrowser output, you need to look into /classes/output.php. The files and folders uploaded from the file browser frontend are restricted for subscribers, access is provided only to admin group/uploader. Is there any way to set the permission of all the files and folders to be accessible for subscribers? Paid for the PRO 6-weeks ago, still did not receiv my lisence-code. Hi, How can I disable the add category button and force user to upload into a specific category. Hi, how can I change “category/folder” name with WPML? For example if I have a folder called Catalogs and I want to change it in Catalogues (for french) and Cataloghi (for Italian). How do I restrict access to a file upload to certain WordPress user roles when I upload the file?